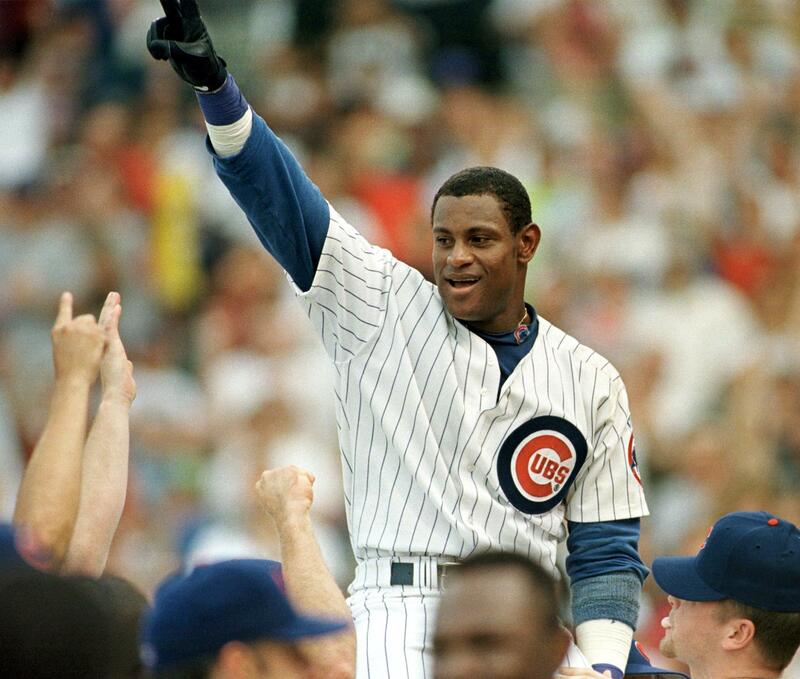 One of the most powerful baseball sluggers in his day, Sammy Sosa had an interesting career. He went from rags to being beloved by America, to his fall from grace. Sosa was born in San Pedro de Marcoris, Dominican Republic, on November 12, 1968. When Sosa was seven years old, his father died and in order to support his family, Sosa had to find a job. He shined shoes, sold oranges, and worked as a janitor. During that time Sosa played a primitive form of baseball and quickly showed that he had a natural talent for the sport. By the age of sixteen Sosa was recruited by a Texas Rangers scout, where he agreed on a salary of $3,500. In 1986 Sosa came to Sarasota, Florida and he made his professional debut in a minor league team in the Gulf Coast League. After showing his skills on the field Sosa was traded to the Chicago White Sox. In his first season he hit fifteen home runs, stole thirty-two bases, and posting a batting average of .233. He was the only player in the American League to reach double digits in doubles, triples, home runs, and stolen bases. Sosa’s second season with the White Sox was less impressive, and he was traded by the White Sox to the Chicago Cubs. During his first six years with the Cubs Sosa’s stats continued to get better, but he was constantly critiqued for showing off and having an inability to focus his talents. However Cubs manager Ed Munch believed in Sosa and extended his contract for four more years, with a $42.5 million contract. Munch’s faith paid off during 1998, from May 25 through June 20, Sosa hit twenty-one home runs in twenty-two games, a rare achievement in Major League baseball. He shattered the single season home run record which stood at sixty-one and came second to Mark McGwire, who hit seventy home runs while Sosa got only sixty-six. Despite coming in second to McGwire, Sosa won NL Most Valuable Player Award. Sosa was in his golden age from 1998-2002, the three seasons that came after 1998 his home run mark never dipped below 50 and he was loved by baseball fans. On the other hand, all good things must come to an end. In 2003, the umpires found that a bat of his was corked, which resulted in suspension and doubts to whether his high number of hits were all legitimate. The troubles did not stop there. He was also accused of using performance enhancing drugs. Although Sosa did deny those charges, the damage was done. Chris Jenkins of the San Diego Union-Tribune wrote “Sosa’s once-lovable image has been severely tarnished by both the corked-bat incident and the way he’s reacted to suspicions of steroid use, not to mention a mysterious dip in his offensive numbers,” (Notable Sports Figures). Sosa was traded to the Baltimore Orioles in early 2005, where he hit his 578th home run. Sosa became fifth on the all time list, however, due to the allegations against him this big event in his career had no steam. The Orioles did not renew his contract, and in November of 2005, Sosa announced his status as a free agent and two years later he retired. “Sammy Sosa.” Notable Sports Figures. Ed. Dana R. Barnes. Detroit: Gale, 2004. Biography in Context. Web. 12 Nov. 2015.